This page provides instructions on integrating an AMTI Force plate system with an OptiTrack motion capture system. When a motion capture system is used in conjunction with force plates, they work together as a powerful tool for various research applications including biomechanical analysis, clinical gait analysis, physiology research, sports performance research, and many more. An OptiTrack motion capture system can synchronize with force plates to obtain both kinematic and kinetic measurements. 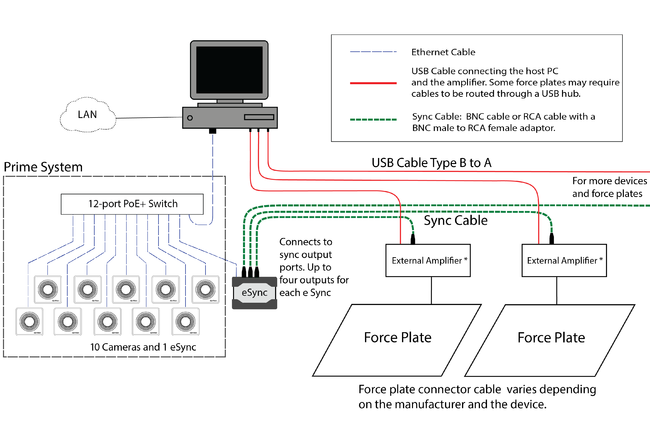 Note that force plate integration is supported only with a Prime camera system using the eSync synchronization hub. For integration support, you must use Motive 1.9 or higher. This page provides quick guidelines to setting up and configuring force plates — with digital outputs — along with the OptiTrack motion capture system. Analog force plate devices can only be implemented via NI-DAQ devices. Through DAQ devices, only the voltage signals will be detected and force plate features (vectors, position calibration, etc.) will not supported. Refer to the NI-DAQ Setup page for detailed instructions on integrating analog devices. Supported Amplifier Models: Gen 5. Force platforms that are compatible with the above amplifier models. Connect each force plate into the host PC. For force plates with external amplifiers, the platform must be connected to a separate amplifier that uplinks to the host computer. Setup the OptiTrack camera system and place the force plate(s) near the center of the volume. See Quick Start Guide or Hardware Setup page for details. 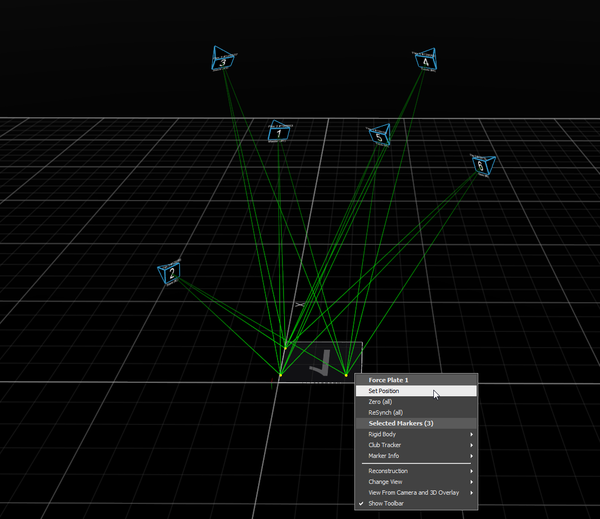 For accurate synchronizations, connect the camera system and the force plate(s) using the eSync 2 synchronization hub. Connect the output ports of the hub to the sync input ports using the BNC cables or RCA cables with matching BNC-RCA adapters. Note: Force plates can also be used without wiring to the synchronization hub. 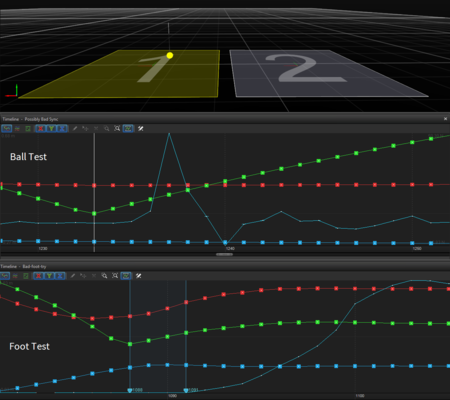 However, without the synchronization signals, motion capture data and force plate data may be off (~ 5 frames). Learn more in the sync configuration section. Note: When a new device is connected to the system, you must re-start Motive to instantiate it. 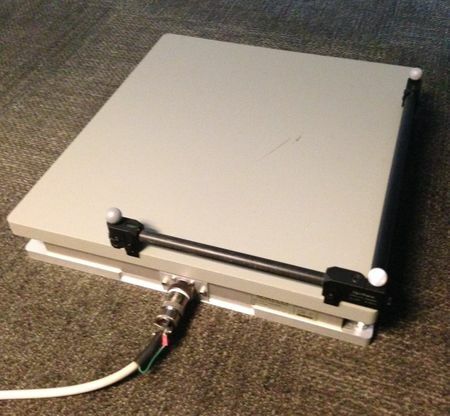 When using an Ethernet camera system, connect the force plate system through the eSync 2 for more accurate synchronization. 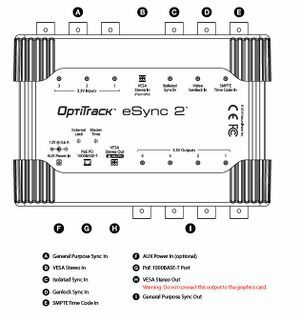 The eSync 2 has signal output ports which can be used to send synchronization signals to the force plates. There are total four output ports, and multiple force plates and external devices can be integrated if needed. Consult our Engineers for multiple force plate synchronizations. When force plate systems have RCA sync ports, use the 50 Ohm BNC Male to 75 Ohm RCA Jack Adapters (included with the eSync 2) and RCA cables to connect the eSync 2 and the amplifiers (e.g. AMTI Gen 5 amplifiers). The following wiring diagram shows how the force plates are integrated into Prime series Ethernet camera system through the eSync 2. Diagram for Prime Camera System with integrated force plates. (*) Some force plates don't have external amplifiers, but instead, have their amplifiers integrated within the platform. In this case, connect sync cables and the USB cables directly to the host PC. NOTE: Synchronization support for USB system has been deprecated. First of all, set up the Flex camera system as instructed in the Hardware Setup pages. Then, set up the Force Plate system as instructed by the manufacturer given instructions. In order for the force plates to be integrated with Motive, the AMTI software must be able to detect the force plates on the host PC. Once both systems are set up, a sync cable must be connected from the master OptiHub into the force plate amplifiers. The master OptiHub is the first OptiHub within the daisy-chained RCA sync chain. On the OptiHub, there is a synchronization output port (External SYNC Out) which can be used to send sync signals to external devices, and we will be configuring this to send out recording signals. Use a BNC-RCA adapters to connect the SYNC Output port to the Trigger Input port on the force plate amplifier. When force plate systems have RCA sync ports, connect a 50 Ohm BNC Male to 75 Ohm RCA Jack Adapter into the output port on the OptiHub(s) and connect each OptiHub to each amplifier using an RCA cable. In order to integrate force plate systems with Motive, you will need to setup the drivers and plugins for the force plates. For Motive 1.10 and above, Motive installer is packaged with OptiTrack Peripheral Module (OPM) which installed during the Motive installation process. The OPM includes all necessary drivers and plugins for integrating external devices including force plates. During the Motive installation process (1.10 and above), a list of program features will be shown in the Custom Setup section. Here, change the setting for the OptiTrack Peripherals Module, as shown in the below image, so that the module is installed along with Motive Files. Note : Even if you are not using NI-DAQ, it is still necessary to install NI-DAQmx drivers that comes up next in the installer. 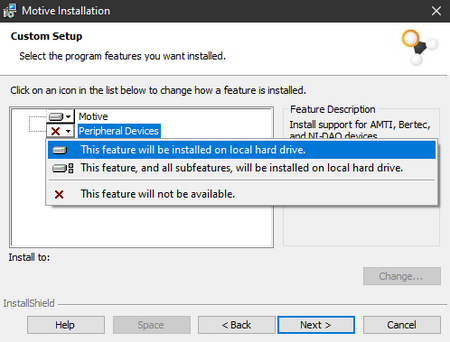 For Motive 1.9, OptiTrack Peripheral Module is not included in the installer, and you will have to follow related user documentation for installing the corresponding force plate drivers. Install any configuration software, drivers, or installation files provided by the force plate vendor. Refer to the related documentations for more information. Configure the force plate software accordingly, and confirm that connected platforms are recognized by the host PC. Install Motive (see the Quick Start Guide for more help). If everything is setup correctly, the force plates will be detected in Motive. Important Note: Install the AMTI software before Motive Install AMTI software → Install Motive. If Motive is installed before the AMTI software, an error may occur from the incompatible version of the Microsoft Visual C++ 2010 Redistributable. In this case, you will need to uninstall Microsoft Visual C++ 2010 Redistributed x64/x84 using the control panel, and then install the correct version of the redistributable by re-installing Motive. 1. Start Motive. If the hardware and software for the force plates are setup correctly, Motive will display the detected force plates with number labels (1, 2, etc..). Motive will notify you of incorrect or nonexistent force plate calibration files. 2. Calibrate cameras. Calibrate the capture volume as normal to get the orientation of the cameras (see the Quick Start Guide or Calibration page for more information). The position of the force plate is relative to the center of the volume, and when you re-calibrate or reset the ground plane, you will need to also realign the position of your force plates for best results. 3. Setup CS-400. On the CS-400 calibration square, pull the force plate alignment tabs out and put the force plate leveling jigs at the bottom. The leveling jigs align the calibration square to the surface of your force plate. The alignment tabs allow you to put the CS-400 flush against the sides of your force plate giving the most accurate alignment. 4. Place CS-400 on force plate. 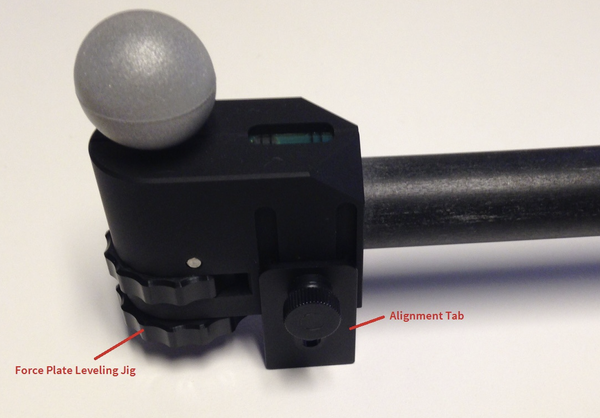 Place the calibration wand on the force plate so that the wand vertex is located at the right-hand corner of the side where the cable input is located (shown in the image below). A correct placement of the calibration square is important because it determines the orientation of the force plate and its local coordinate axis within the global system. The coordinate system for force plates are independent of the system used Motive. AMTI force plates use the right-hand system. The long arm of CS-400 will define the Y axis, and the short arm will define the X axis of the force plate. Accordingly, Z axis is directed downwards for measuring the vertical force. Force plate with CS-400 aligned properly. 5. Set force plate position in Motive. After placing the calibration square on the force plate, select the CS-400 markers in Motive. Right click on the force plate you want to locate, and click Set Position. When there are multiple force plates in a volume, you may need to step on the force plate to find which platform the calibration square is on. In Motive, uncalibrated force plates will light up in green and a force vector will appear when you step on the plate. Repeat step 4 and 5 for other force plates as necessary. Referencing to the markers on the calibration square, Motive defines the location of the force plate coordinate system within the global coordinate system. Motive uses manufacturer defined X, Y, and Z mechanical-to-electrical center offset when calculating the force vector and the center of pressure. For digital based plates, this information is available from the SDK and also stored in the plate's on-board calibration data. 6. Zero force plates. After you have calibrated each of your force plate, remove the CS-400 from the volume. Right click one of your force plates in Motive and click Zero (all). This sets the current force on the plate data to 0. This will account for a small constant amount of measurement offset from the force plate. Remember that it zeros all of the force plates at once. So make sure there are no objects on the force plates. To view and confirm the live force plate data, open the editor from the Timeline Pane. 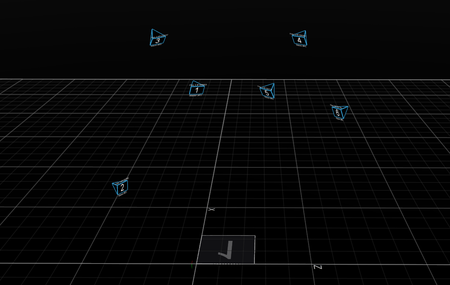 Then, open the Project Pane (or Cameras Pane) and select one of the force plates. A list of available channels will appear under each force plate instance. Here, you can confirm that your force plates are working properly. Select Fx, Fy, Fz, Mx, My, or Mz channels to view the live force plate data from the timeline. Multiple channels can be displayed at once. When both reconstructed markers and force plate channels are selected, the force plot will be sub-sampled in order to be plotted along with trajectory data. If you wish to double check the force plate position calibration, you may create a long trackable rigid body and use it to apply force against force plate. If the force plate location is precisely calibrated in Motive, the force vector will go right through the rigid body. A resultant force vector displayed in Motive. The force and moment data reflects the coordinate system defined by the force plate manufacturer, which is typically the Z-down right-handed coordinate system. Note: This convention is independent from the global coordinate system used in Motive. Thus, the Fz components represent the vertical force. For more in-depth information, refer to the force plate specifications. Open the Cameras Pane and the Synchronization pane. In the Synchronization pane, select the Custom Synchronization mode from the dropdown menu. Set the Sync Input → Source to Internal Clock. Set the Sync Input → Clock Freq to 1000 Hz, and set the Sync Input → Input divider to 10. Set the Sync Output 1-4 → Type to Record Start/Stop Pulse or Recording Gate triggered sync. Click Apply from the Synchronization pane. 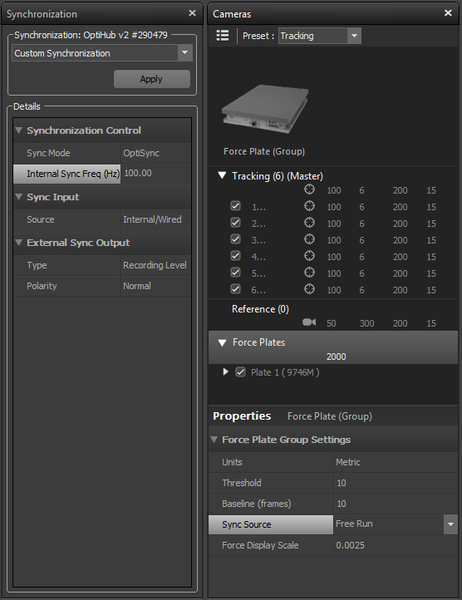 In the Cameras Pane, select the force plates group and double check that the Sync Source is set to Free Run for the force plates. Example settings in the cameras and synchronization panes for eSync. In the Synchronization pane, select the Custom Synchronization from the dropdown menu. Set the External Sync Output → Type to Recording Level or Recording Pulse triggered sync. Make sure that the sampling rate for the force plate is a multiple of the tracking frames per second (fps), ex 100 fps and 2000 fps. The camera frame rates can be checked from the Cameras Pane. Click the Apply button from the Synchronization pane. Example settings in the cameras and synchronization panes for OptiHub. If you are using an Ethernet system without an eSync, ignore the synchronization configuration options. From the Cameras Pane, make sure that that the force plate sampling rate is a multiple of the tracking frames per second (fps), ex 100fps and 1000fps. Motive will alert you if the sampling rates for cameras and force plates disagree. Without a master synchronization device, recording for the camera system and the force plates will not be triggered exactly at the same time. 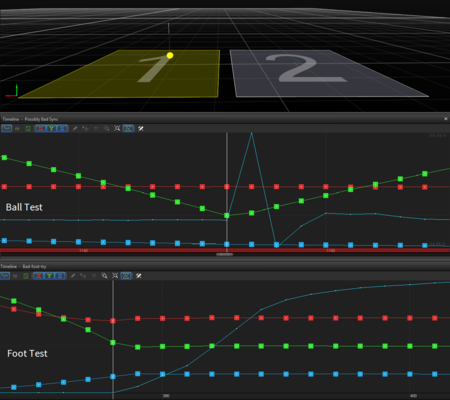 This can cause problems for longer takes because the sampling timing for mocap data and the force plate data will eventually deviate from each other. If you want your system to be timed perfectly, we recommend synchronizing through the eSync 2. 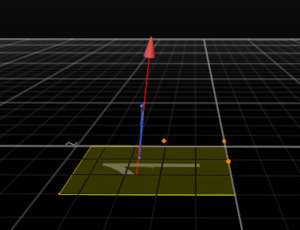 When the force plate sampling rate is not set to an integer multiple of the camera frame rate, force plate data may record improperly; which is shown in the following screenshot. The force plate stops recording when its sampling rate disagrees with the frame rate of the camera system. 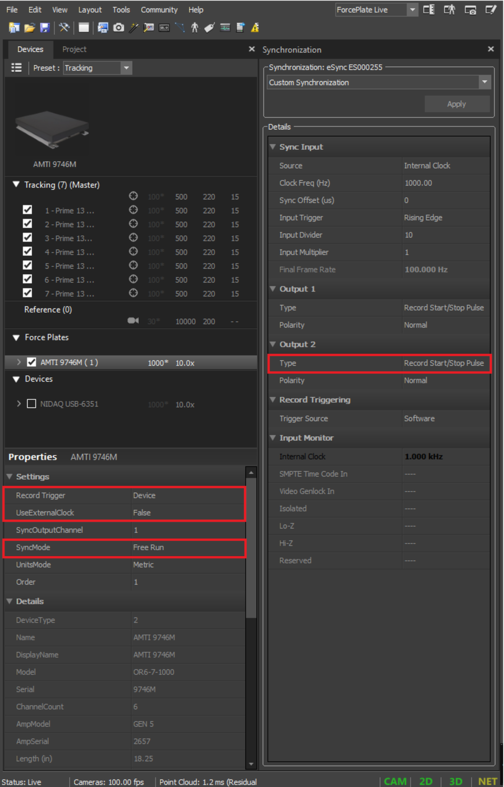 From Motive, you can export the tracking and force plate data into C3D files. 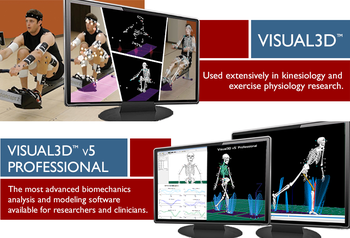 Exported C3D files can then be imported into a biomechanics analysis and visualization software for further processing. See the Data Export or Data Export: C3D page for more information about C3D export in Motive. 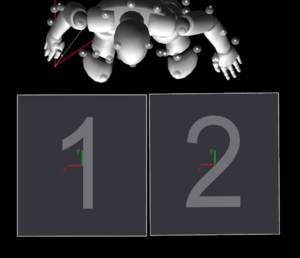 Note that the coordinate system used in Motive (y-up right-handed) may be different from the convention used in the biomechanics analysis software. 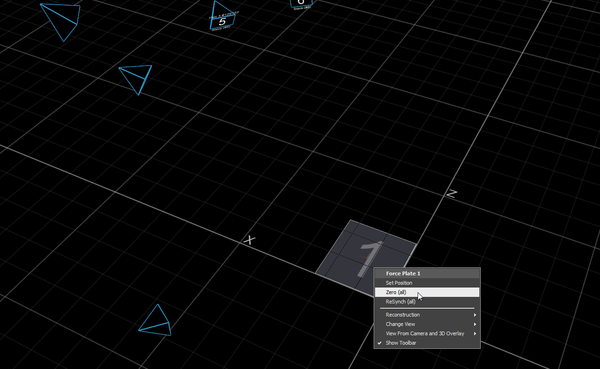 Since Motive uses a different coordinate system than the system used in common biomechanics applications, it is necessary to modify the coordinate axis to a compatible convention in the C3D exporter settings. For biomechanics applications using z-up right-handed convention (e.g. 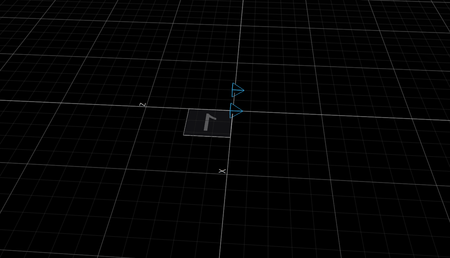 Visual3D, MotionMonitor), the following changes must be made under the custom axis. Note: For Motive 1.10, Y axis must be converted to positive Z instead, this issue has been fixed on Motive 1.10.1 and above. This page was last modified on 3 August 2017, at 18:08.